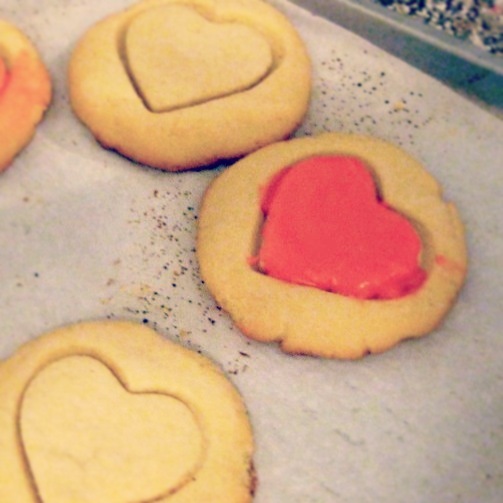 I’m planning to make these again soon as a nice Valentine’s day treat, but I’ve used the same dough recipe to make other cutouts too. You can view the original recipe on Everyday Food, and, if you’re interested in my less-competent, real-life experience making them (as adapted from my former blog! ), you can find my version below. After about 3 minutes, add the egg and 1 teaspoon of the vanilla extract and beat until combined. Then gradually add the flour mixture. (Also, at this stage, I try to use my hands as much as possible, since the batter should be pretty doughy at this point. Place the rest of the granulated sugar in a small bowl. Roll the dough into 1-inch balls. Coat them with sugar, and then transfer to two baking sheets lined with parchment paper. use a glass (or in my case, a beer bottle) to flatten, and then press the cookie cutter into each, being careful not to cut all the way through. bake until cookies are golden at the edges, they say approximately ten minutes but mine sometimes take longer even though my oven gets pretty hot. (They also suggested to rotate the two baking sheets about halfway through, but really, who does that.) Anyway, when done, let them cool. Un-iced, you can save them in an airtight container for up to 4 days. now for the icing! whisk together confectioners’ sugar and 3/4 teaspoon vanilla extract, and 1 3/4 teaspoons cold water. then add your food coloring of choice and spread the glaze in the heart with a small spoon or something with a flat edge. allow it to set for 15 minutes.